I assume the pleasure that science lovers find in science fiction genre, liberal arts (called also humanities) lovers will be able to find in the genre that if doesn't exist, yet, has been invented by author Rebecca Coffey in this very book - "humanities fiction". Whereas machines and robots do all kinds of tricks in the genre of science fiction, tricks are played on concepts known from humanities here - including the concept of "informed consent about the intentional infliction of pain" (in Skinner's case), God-killing (in the Nietzsche's case), making fun of "being well-read in humanities itself" (in the case of counter-culture god whose name I won't mention because there exists a more radical post-First World War counter-culture poetSrečko Kosovel who still waits to be discovered by Anglo-Saxon literary world -- with the exception of his biographer Erica Johnson Debeljak whose biography was published in translation in 2004, but has not been published in English original (as of 2013), yet...)The other humanities gods, dethroned by iconoclastic Rebecca Coffey, include John Steinbeck with his Grapes of Wrath turned Crêpes of Wrath by Coffey, two psychoanalytic gods (you guessed right: Sigmund Freud and Carl Jung) plus a failed artist (no, it's not the author of Main Kampf) Hermann Rorschach, selected members of female literary pantheon Mary Wollstonecraft Shelly, Anaïs Nin, and Dorothy Parker balanced by the male literary gods, including the god of literary nonsense Lewis_Carroll, the literary modernism god James Joyce, the post-First World War "Lost Generation" hero Scott Fitzgerald, the macho god Ernest Hemingway, the Cold War semi-god James Bond inventor Ian Fleming, the To Kill a Mockingbird's author Harper Lee, not to mention the goddess of proper etiquette and manners Emily Post, the goddess of cultural anthropology Margaret Mead, film-making Cohen brothers, the Divine Comedian Dante Alighieri, and the Father of English literature Geoffrey Chaucer. Rebecca Coffey - By day Rebecca Coffey is a science journalist, contributing to Scientific American, Discover, and Vermont Public Radio. She also presents a weekly radio spot, Family Friendly Science, on the nationally syndicated show, Daybreak USA. By night she is a novelist and humorist. Hysterical: Anna Freud's Story is due out in May 2014 from She Writes Press. 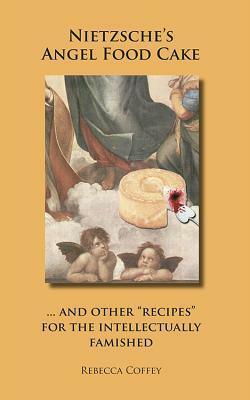 Nietzsche's Angel Food Cake: And Other "Recipes" for the Intellectually Famished was published in October 2013 by Beck & Branch.